Buckle up, fans of shared transport solutions. We reported last month that Bus Simulator 16, the game about driving a bus, had been delayed from its scheduled launch date of January 20 to the not-too-distant March 2. That new date isn't quite upon us yet, but apparently it's close enough to justify this launch trailer. 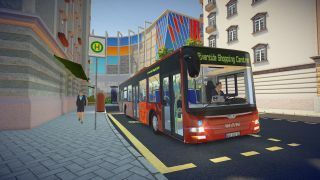 Bus Simulator 16, the trailer says, will feature six “realistic” buses and two MAN Lion's City buses (I looked that up so you don't have to), a driver reputation feature—timeliness, cleanliness, non-vehicular homicide-liness—variable fares, “diverse events” such as extending the wheelchair ramp, a “catchy” route editor, and a multiplayer option that lets you pit your bus company against those operated by family, friends, and your worst enemies. It even supports mods! Since I have your attention, here are the system requirements, courtesy of Steam. I don't play a lot of these kinds of games myself—if I wanted a real job, I'd go get one—but I love that there's a place for them side-by-side with more mainstream fare like Call of Duty, Far Cry, and Fallout. Of course, bus simulators aren't entirely new, but I think this one will be a little more interesting to play than its slightly-more-famous predecessor.